Remington’s Buffalo Soldiers Frederic Remington and his groundbreaking illustrations of the 10th Cavalry in Arizona. For the December 1886 issue of Outing: An Illustrated Monthly Magazine of Recreation, a relatively obscure illustrator named Frederic Remington joined the pictorial team. He was to assist in bringing to life 1st Lt. John Bigelow Jr.’s prose of his days with the 10th Cavalry black troopers in Arizona Territory. John had arrived at Fort Grant in June 1885. He often left garrison routine for long stretches of time campaigning against Apaches. In March 1886, his diary entries began appearing in serial form under the title “After Geronimo,” which ran through April 1887. 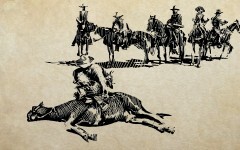 Remington had limited exposure as an artist, having started with modest fledgling efforts such as a depiction of cowboys that ran in the February 25, 1882, edition of Harper’s Weekly, followed by a few other renderings based on an outing to Arizona in 1885. A chance meeting and ensuing friendship with Outing’s editor Poultney Bigelow (John’s brother), which had started years earlier during Remington’s days as an art student at Yale, brought the aspiring illustrator a major opportunity to further his ambitions. 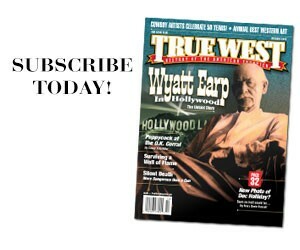 Rather than working in a studio, as many illustrators did during the era, the plump Easterner traveled to Arizona to gain an eyewitness perspective of the Apache wars that were much on the public’s mind at this time. Setting out by train from New York, the green dude packed artist’s supplies and a fresh bound volume with blank pages that became his “Journal of a trip across the continent through Arizona and Sonora Old Mexico.” This excursion was an important part of Remington’s apprenticeship, which, between 1886 and the end of 1888, would result in more than 200 illustrations for U.S. periodicals. 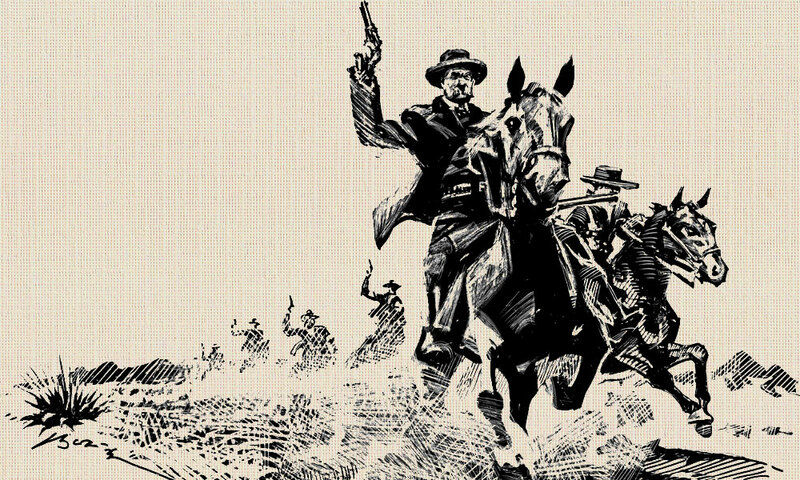 Remington set out in earnest, as his diary entry on June 10, 1886, indicated: “Got up late after a good night rest at Palace Hotel [Tucson], took camera went up to the detachment of 10th Colored Cavalry—took a whole set of photographs.” Some of the resulting illustrations were more caricature than fine art, but even in their raw simplicity, they conveyed a glimpse of a heretofore unexplored topic—the black soldier in the West. 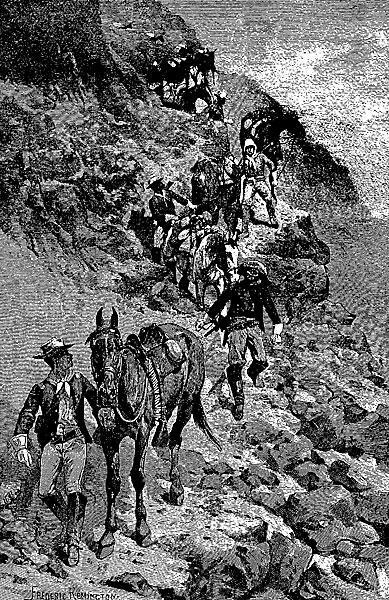 Remington’s trek to Arizona inspired him to illustrate a dramatic incident he had learned about from eyewitnesses. Although the Louisiana-born officer previously had little respect for blacks in general, Clarke now challenged his mother in his letter: “Do not tell me about the colored troops there is not a troop in the U.S. Army that I would trust my life to as quickly as this K troop” of the 10th Cavalry. Remington also formed a friendship with Clarke, which would continue until the lieutenant’s untimely death in 1893. 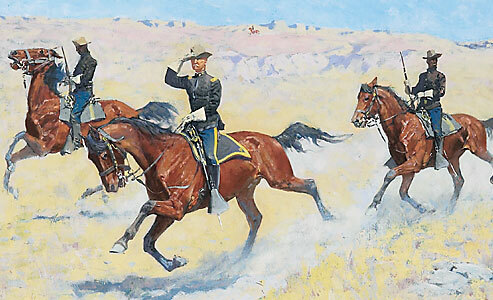 Clarke even served as the artist’s host during yet another trek to Arizona, which in great part helped launch Remington’s career. Clarke equipped the artist with an army mount and a McClellan cavalry saddle fully loaded for their foray from Fort Grant to Fort Thomas and San Carlos Reservation and back. Not all of what Remington ultimately revealed in his subsequently published article came from the trail. He supplemented his cache of images with those taken during his stay at Fort Grant. Clarke, Claude Corbusier (one of the post surgeon’s sons) and Pvt. Henry Jackson (the doctor’s black servant) galloped up and down the parade ground to perform mounted displays for the visiting artist. 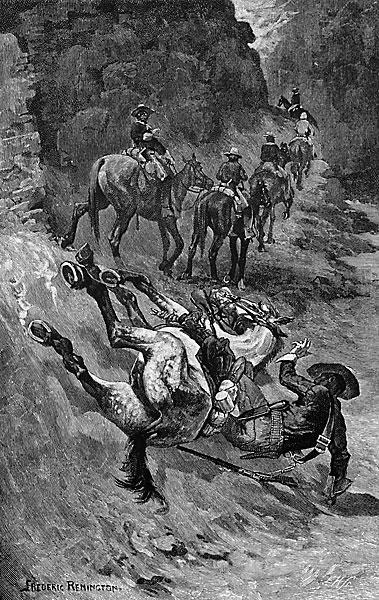 Jackson even served as Remington’s model for the well-known illustration of a lone trooper descending a steep slope with his mount checked by tightened reins. He stockpiled everything he needed to furnish The Century with his text and accompanying illustrations for his now famous article, “A Scout With the Buffalo Soldiers,” which appeared in the April 1889 issue. Remington also drew two versions of a historic 1868 charge made by Troop H of the 10th, which had ridden to the relief of the legendary siege at Beecher’s Island. The artist provided a romanticized image of an event that he had not witnessed personally, and thereby, the work lacked the authenticity often associated with his other portrayals of black soldiers whom he had observed firsthand. But Remington’s periodic straying from accuracy would be balanced by other work, including an exceptional representation of black soldiers in Arizona and on the Great Plains that included infantrymen as well as cavalrymen. Nor did his efforts end with the taming of the frontier, after denizens such as the “redoubtable ‘Apache Kid’” had ceased to require the U.S. Army to engage in arduous campaigning in the West. Both black and white troops would find themselves fighting a “splendid little war” in Cuba, Puerto Rico and the Philippines. Remington was there, to capture men of both races who wore Army blue. By then, his early days scouting with Buffalo Soldiers had earned him a name as an artist. John Langellier received his PhD in history from Kansas State University. He is the author of dozens of publications focusing on military subjects, and he has also served as a motion pictures and TV consultant. Remington’s field experiences with the black troopers helped him to shed some of his prejudices. As such, he provided a sympathetic view of them in his 1888 illustration A Tumble from the Trail. While Remington arguably set the stage for depicting blacks in the U.S. Army of the late Victorian era, by the time of the Spanish American War a few other artists, such as Fletcher C. Ransom, followed his lead thereby adding to the lore of these black soldiers in blue. 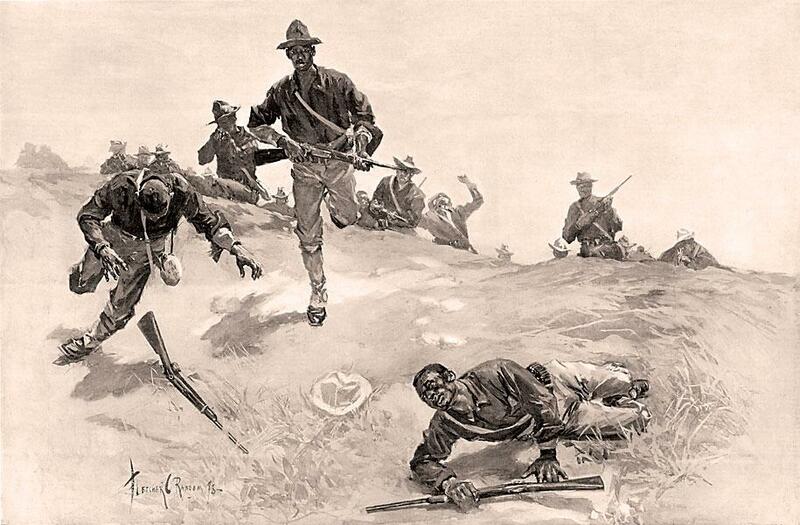 In his 1898 illustration, Ransom depicts the 9th Cavalry charge up San Juan Hill. 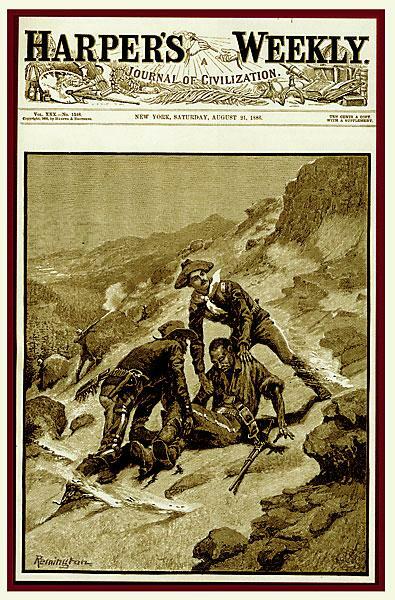 For the August 21, 1886, edition of Harper’s Weekly, Remington captured white Lt. Powhatan Clarke’s heroic act of saving one of his black troopers, Cpl. Edward Scott, during a desperate encounter with Apaches in May 1886. 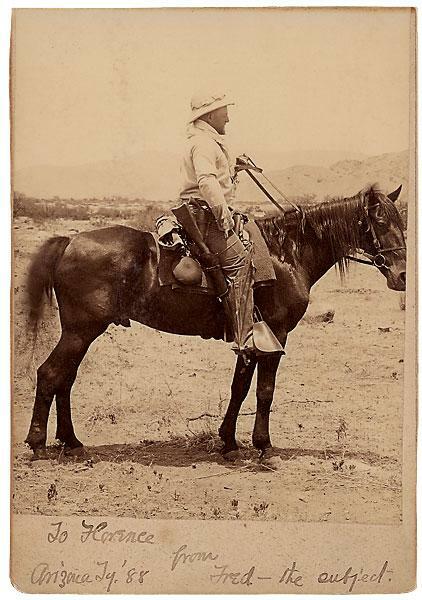 Check out Frederic Remington’s pith helmet! 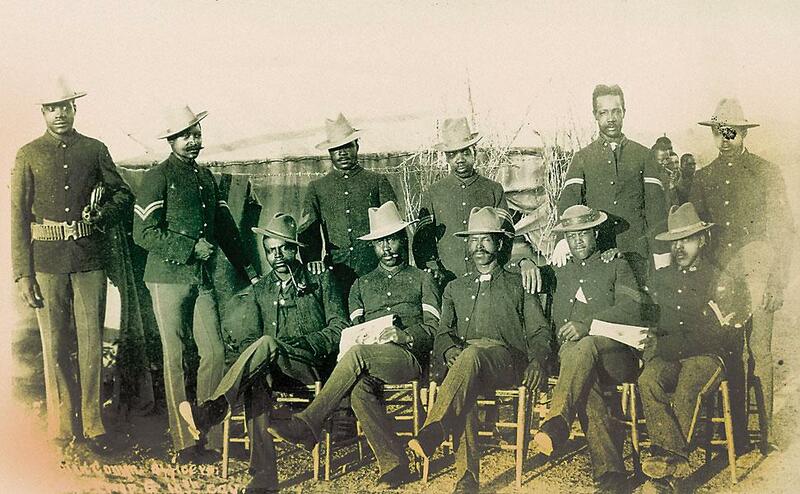 He posed for this photograph during his tour with the Buffalo Soldiers in Arizona. 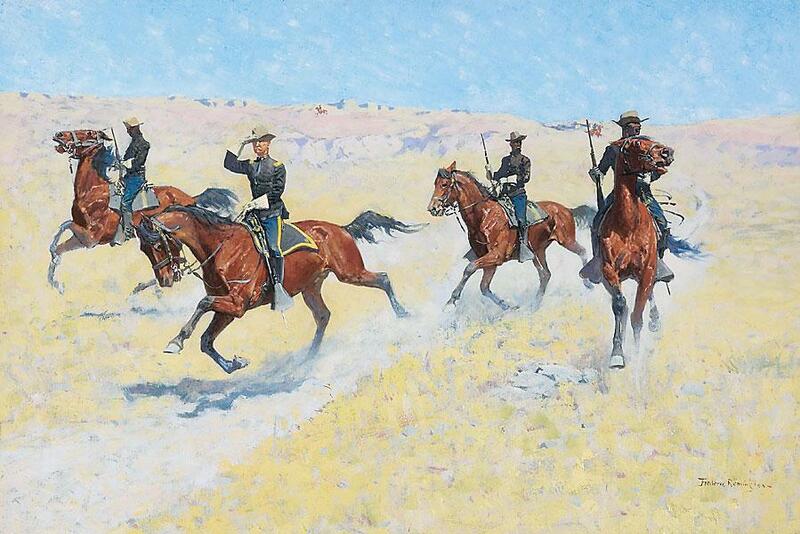 Artist Frederic Remington’s impressions of Arizona were reinforced during his rides with the 10th Cavalry troopers. 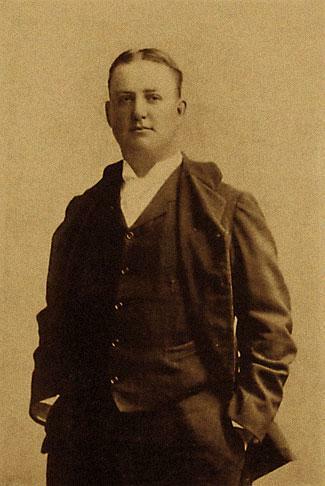 A young Frederic Remington, believed to be taken by William Notman of Montreal, circa 1882, four years before his time with the Buffalo Soldiers. John Langellier received his PhD in military history from Kansas State University. After a 45-year career in public history, he retired in Tucson, Arizona, in 2015. He is the author of dozens of books, including Fighting for Uncle Sam: Blacks in the Frontier Army, due out in early 2016. 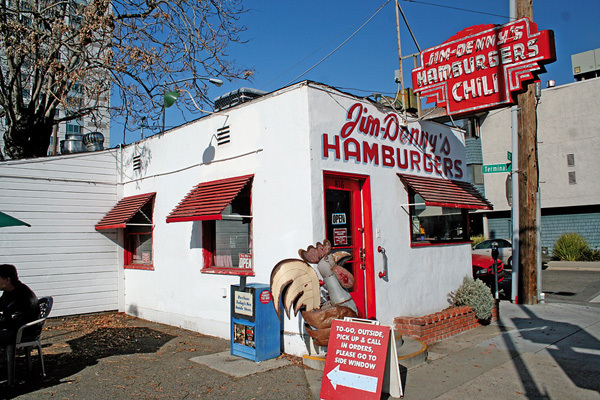 West’s Best Greasy Spoons Ten places that dish up good eats.